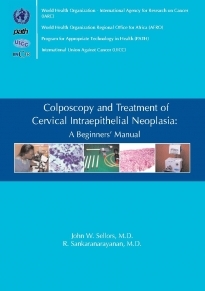 This manual is designed to teach medical and nursing personnel to detect and treat cervical intraepithelial neoplasia. It is especially relevant to screening and early detection of cervix cancer in developing countries where diagnostic and therapeutic expertise are not readily available. The manual was developed during the implementation of several cervical cancer screening and treatment programmes, and draft versions were used in over 20 training courses on colposcopy and management of cervical precancers in nine different countries in Africa and Asia. The 150 color illustrations have largely been drawn from these projects and training courses. The book is an A - Z teaching resource in the diagnosis of cervical precancers using colposcopy, and in the treatment of cervical intraepithelial neoplasia using cryotherapy and loop electrosurgical excision procedures.